In continuation of Play 2.x (Scala) is it a Spring MVC contender? – Introduction, in this blog, I extend my earlier blog Incorporating Authorization into Play 2.x (Scala) application to integrate with LDAP instead of database. Again there might be better ways to do this, but right now there is no clear documentation. A quick googling will display this Google group link and this link and this Github code. All of them were of little help to me. So I took the 1st step and put one of these. I have used Unboundid LDAP SDK‘s InMemoryDirectoryServer. This entry was posted in Scala and tagged Scala on March 29, 2013 by Krishna. In continuation of Play 2.x (Scala) is it a Spring MVC contender? – Introduction, in this blog, I will demonstrate how to use play20-auth to adopt to coffee example. case 0 => "failure" -> "Entity has Not been deleted"
case x => "success" -> s"Entity has been deleted (deleted $x row(s))"
Notice how we use StackAction and validate for Administrator permission in the controller. This entry was posted in Scala and tagged Scala on March 28, 2013 by Krishna. I have been playing with Scala and Play 2.x for past 6 months and have gained lot of knowledge. I have been working with Spring related technologies for past 8 yrs. In the next few blogs I will be really exploring if the Scala flavor of Play 2.x is ready for prime time. As usual, I will be exploring how well we can build Data Access Layer, Controller, Frontend integration with Play 2.x using Test Driven Development. I will also be exploring how well Play 2.x is integrated with Security (Authentication/Authorization) capabilities and how well Scala is integrated with other Authentication systems like LDAP. The use case I will be talking in the next few blogs is the popular Coffee Supplier web application, which demonstrates a simple CRUD base application. And I will elaborate aspects only Admin users can create the Coffee and Normal users can see the list. One common thing about Play 2.x and Spring MVC is both follow MVC design patterns. There are also other Scala Web frameworks like Lift, I haven’t played with it yet. In this example, I will use popular tools like Slick to access the Database, Play-Auth to do authentication and authorization. And I will extensively use ScalaTest to do Test Driven Development( TDD)/ Behavior Driven Development( BDD). This entry was posted in Scala and tagged Scala on March 22, 2013 by Krishna. This entry was posted in Scala and tagged Scala on March 20, 2013 by Krishna. In continuation of Play 2.x (Scala) is it a Spring MVC contender? – Introduction, in this blog, I will demonstrate how we implement a simple test to test the Web layer using TestServer. I will continue from my earlier example of Implementing Controller using Play 2.x (Scala), ScalaMock where I did the mock testing. Refer Build.scala for build configuration. I hope this blog helped you. 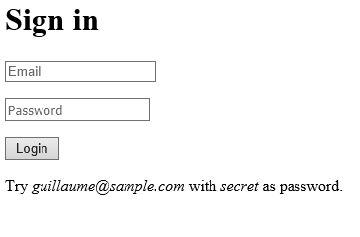 In the next blog I will implement simple authentication. In continuation of Play 2.x (Scala) is it a Spring MVC contender? – Introduction, in this blog, I will demonstrate how we implement a simple Controller implementation using ScalaTest / ScalaMock. I will continue from my earlier example of Implementing DAL in Play 2.x (Scala), Slick, ScalaTest of the basic CRUD operations on Coffee catalogue. If you notice, we are extending FunSpec of ScalaTest for BDD. Also the HTTP status is SEE_OTHER, this is because the Success is redirected to Index page. I hope this blog helped. In my next blog, I will talk about controller routes testing and Frontend testing. In continuation of Play 2.x (Scala) is it a Spring MVC contender? – Introduction, in this blog, I will demonstrate how we implement a simple Data Access Layer using ScalaTest and using Behavior Driven Development. The technical stack I will be using for this demo is Java 7, Play 2.1.0, Scala 2.10.0, Slick 1.0.0, ScalaTest / ScalaMock 3.0, STS IDE for Scala Development, Scala IDE plugin with ScalaTest. Let us open STS IDE and create a DomainTest.scala under test folder. The intent is we create a new CoffeeComponent class and implement a method findById method and pass a Coffee name and return the Coffee object and assert for its price. We also need initialize the data we are supposed to assert. One bug I noticed is, when there are multiple test cases opening database connection it will create Attempting to obtain a connection from a pool that has already been shutdown error. I hope this blog helped you. In the next blog I will demonstrate how we can mock a Controller and test the Controller.